It doesn't matter who played or who produced. It doesn't matter if it's "classical" or "ambient". And it certainly doesn't matter that it was released in 1980. Fourth World, Vol. 1: Possible Musics is still an album unlike any other. We all love to glance backward. There are plenty of reasons for us to do so, various offshoots of pleasure being a primary one. If you check around online long enough to see what music people are currently the most excited about, you'll find that it's reissues and vinyl reissues. 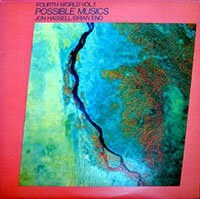 I will not go into an analog vs. digital debate over the listening experience, but I will state that the Glitterbeat label's re-release of Jon Hassell and Brian Eno's 1980 collaborative album Fourth World, Vol. 1: Possible Musics has more than just nostalgia trailing behind it. In a time when popular culture appears to be going in a million different directions at once, we witness collisions daily. We see the old breeding with the new, the Far East meeting the Old West and the digital age blurring all of humankind so frequently that we are rarely shocked, let alone surprised by what happens around us. We have all displaced our collective moments of "Eureka!" in favor of convenience. A record like Fourth World, Vol. 1: Possible Musics, if we let it, has the ability to transport us back in time to a moment when multiple genres of music were cozying up to one another for the first time. And it gave people chills. It gave a certain composer wider attention, it gave even greater credibility to an esteemed producer and held many an imagination hostage long enough to spark a whole new musical movement. And like many other masterpieces, it kind of has a thorny story behind it. Fourth World was supposed to signify... in those days, the Cold War days, there was the First World and basically the unspoken Second, which was the Soviet empire. Anything outside of those two was called Third World, and it usually meant less developed countries. And those less developed countries were places where tradition was still alive and spirituality was inherent in their musical output, for lack of a better term. (Fourth World) was like '3 +1'. The idea was the merging of the traditional and spiritual side from the Third World with the First World technology, using the harmonizer and that kind of thing. The harmonizer that Hassell speaks of in that final sentence is an effect he applied to his trumpet. As he played a note, an accompanying note was produced in real time. The two or more lines of notes moved as one, eliminating the chance of a messy overdub and freeing the trumpeter to improvise. This technique was quite important to Hassell's work in general and a guy like Brian Eno was only too eager to jump in on the action. As he confesses in his essay, "It was music I felt I've been waiting for." The two men, in conjunction with percussionists Nana Vasconcelos and Ayibe Dieng, set out to explore this new Fourth World. Then arose the problem of credit. Hassell was keen to have his album sell and he knew that a name like Brian Eno's carried significant cache. So even though Fourth World, Vol. 1: Possible Musics was a Jon Hassell album with Brian Eno acting as producer, Hassell agreed to bill the album as a Jon Hassell / Brian Eno collaboration. And apparently, even after the two men have reconciled their differences and remain close friends to this very day, this still seems to stick in Hassell's craw. Having his name tethered to another that belonged to a commercially successful producer and a self-described "non-musician" threw Hassell's core values for a loop and he spent the remainder of the '80s trying to crawl out of the pop pigeonhole. The Brian Eno and David Byrne collaboration My Life in the Bush of Ghosts was supposed to have Hassell as the project's third wheel, but things just got messier from there. Upon hearing a tape of a world music / synth-pop sample mashup that Eno and Byrne had cooked up, Hassell became incensed that they were using his techniques to further their careers. Even though the dust has long since settled, it clearly still bothers Hassell, who stated in a recent interview that "I was a composer[,] okay? I was not an art school graduate that picked up a guitar." Yeah, we all kind of figured that. It's been nearly 35 years since Fourth World, Vol. 1: Possible Musics saw release and to say that time has been very good to it kind of misses the point. Hassell was vibrating on a wavelength well outside of jazz, classical or even ambient music back then, so calling it timely would be as foolish as calling it timeless. Fourth World, Vol. 1: Possible Musics beams in from an era that never really was, one that collected components that slipped through the cracks of popular culture. Play it for your co-workers in the year 2014 and you'll still get strange looks. The rhythm section of Vasconcelos and Dieng are holding things together in a way that makes the word "tenuous" synonymous with "tight". Author Pat Thomas, who conducted the interview with Hassell in the reissue liner notes, refers to Fourth World, Vol. 1: Possible Musics as one grand piece of music that happened to be broken into six tracks. This is not altogether incorrect nor is it meant as a criticism. This is a record heavy on atmosphere, a peculiar notion for such a serious self-proclaimed composer, and everything else feels like a second priority. Indeed, if you are new to Fourth World, Vol. 1: Possible Musics, it's all going to sound the same to you for the first few listens. The more frequently you return to it, the greater the rewards. The bass line suspending Hassell's eastern melody for "Chemistry" will start to glow. The synthesized horn of "Delta Rain Dream" will transform into a meadow. The cycled trumpet sample of "Rising Thermal 14° 16' N; 32° 28' E" will hypnotize you. And Hassell's opening lines to the 21:37 closer "Charm (Over 'Burundi Cloud')" will baffle you. Think: Frampton's talk box. After all the tantrums over who was responsible for what and which labels should be applied to what sounds, what stands is a work of art. Fans of Hassell already knew this, as did those who followed Brian Eno's career closely enough to be intrigued by Another Green World and Before and After Science. As the thrill of discovery continues to crumble around our nebulous all-access era, a record like Fourth World, Vol. 1: Possible Musics can still feel the threat of getting lost in this modern cluster. I myself grow wary of the numerous reissues that spring up weekly. But having said that, I'm glad that Fourth World, Vol. 1: Possible Musics is given the opportunity to snag a few more listeners. Who knows, one of them might be our future Hassell.